This page lists all known Russell Hoban books and other works (collectively referred to as "titles"). The titles that have a full information page with a synopsis, jacket image and publication details are linked accordingly; titles that are not linked require information to be added. If you can help provide information on unlinked titles please see this page for more details. "I, that was a child, my tongue's use sleeping"
Manny Rat: A Fragment (from the unfinished novel The Return of Manny Rat, a sequel to The Mouse and his Child). The above list includes 13 poems not originally included in the 1968 edition, added in the 1989 edition. Which of Russell Hoban's books would be a good introduction to his huge body of work? Try this list of suggested titles. Death is much on singer Christabel Alderton's mind because the men in her life tend to die before their time and she's come to think she's bad luck. Diabetologist Elias Newman is keen to know her better but she's afraid of what might happen. 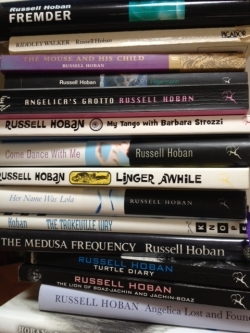 Add a Russell Hoban title today! The title below needs a formal entry in our bibliography, with a synopsis and jacket photo. Can you help?